... will lessen the time you spend cleaning a kitchen daily! Cleaning a kitchen requires lots of extra attention. This is because the kitchen is where the food is. It is where it's stored, cooked and eaten. It is also one of the rooms in the house with lots of traffic, which means a lot more cleaning. Below is the strategy that I use to help maintain a clean kitchen. Before we get started - here are a few housecleaning tips. Gather all the cleaning supplies you think you will need for cleaning your kitchen. Investing in a caddy - basket or container which can hold all your cleaning products will help. Keep your caddy in a secure location (out of the reach of children) in or close to your kitchen. When you are ready to clean, your cleaning supplies will be at hand. Rubber gloves are your hands best friends. The chemicals is most cleaning products can damage the skin. Besides gloves, to lessen damage to your hands you should try using natural cleaning products when cleaning a kitchen. Fully cleaning a kitchen - my own kitchen, usually takes me about two days. This is according to how much time I have. On the first day I do the hard stuff. I clean the refrigerator, the oven and the stove. The second day is reserved for the ceiling, walls, and kitchen cabinets. I also use this opportunity to get rid of clutter (dump what I don't need and keep what I do need). Finally I give the floor a chance to shine. The importance of this appliance is not only measured by it's size but also by it's function, that is, storing your food safely. Innovations over the years have made oven cleaning a very simple job. Cleaning ovens these days can range from a simple wiping to a down and dirty scrubbing. When cobwebs rule your ceiling and the top corners of your walls, it's time for an overthrow. Your broom is an effective weapon. Use your broom sweep the cobwebs off your ceiling and walls. To avoid having to clean cobwebs off your broom, before you begin, wrap a cloth around it. The cloth can just be thrown away or in the wash afterward. While doing some research online, I found two brilliant substitutes for the broom. They are called the cobweb eliminator and the telescoping duster. Check them out. You will see that they can by use in to high to reach places. Next give the walls a wash. You can use an all purpose cleaner mixed in a bucket of water and a sponge or rag. Dip the sponge into the bucket and wipe the entire wall starting from the bottom moving up the wall. Then rinse the wall with a different sponge dipped in water. Complete all the walls in the kitchen using this procedure. A simple dusting with a rag will do for these areas. But before you get to that you'll need to empty your kitchen cabinets. Once it's emptied simply clean it out with a rag. Once you are satisfied with your clean kitchen cabinets put everything back into it neatly. Now for cleaning the surface of your kitchen cabinets, I recommend that you use the kitchen cabinet creme, a cleaner and polisher that will remove any built up grime on your kitchen cabinet surfaces. 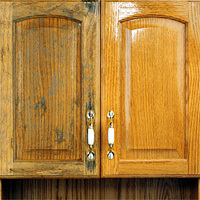 Click here for more information on cleaning kitchen cabinets. At last its time to clean the kitchen floor. This should only require sweeping followed by mopping. Now that you have done all the hard work of cleaning a kitchen, it's time to think of maintenance. 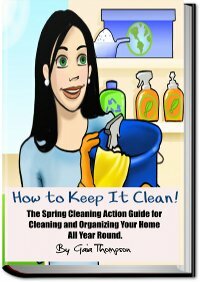 Create a house cleaning schedule for cleaning a kitchen. In it write done what you will do daily, like empting the trash and wash dishes. Weekly, mopping of the floor and cleaning the refrigerator and oven when necessary. Have fun cleaning a kitchen!